The pipe band was founded in October 1960 by a small group of former members of the Scottish Regimental Association of Yorkshire Pipe Band (“The Yorkshire Jocks”), during a meeting at a well known Public House in Leeds. Formed as a self-supporting, non-profitmaking organisation with the aim of encouraging interest in the music and culture of Scotland, they quickly formed an association with the Leeds Scottish Country Dance Club and were able to provide an added attraction with the performances of the dancers. Having caught the eye of a wrestling promoter, who had formed a Scottish wrestling team touring Yorkshire, Lancashire and the North of England, the pipe band was invited to provide a group of pipers to lead the wrestlers into the ring. These engagements provided the firm base from which the band was able to gain publicity, thence finance for the provision of equipment. By now the pipe band had begun to attract the support of many and varied organisations. Engagements followed and, during 1961, no less than 30 were fulfilled. By 1962 there were 16 playing members and many repeats of engagements from previous years were forthcoming. Various items of uniform were purchased in addition to a complete new set of drums and 12 matched Hardie chanters. These essential items were necessary to enable the pipe band to prepare fully in order to realise its ambitions of becoming not only a group of entertainers, but also a successful competing pipe band. 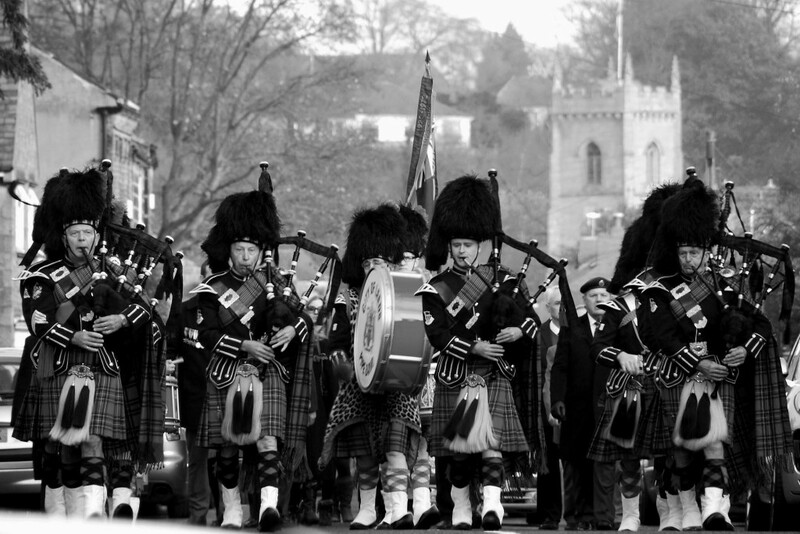 During 1964, the pipe band gained membership of the Scottish Pipe Band Association (now Royal Scottish Pipe Band Association) and entered their first competition, organised by the N.W. England branch at Chorley. Engagements were plentiful and varied and by 1965 membership had increased to a total 25 and we had started to reach the prize list in competition. The next target was to improve the appearance of the band and to this end new kilts, plaids, tunics and feather bonnets were purchased, with badges designed and made by our leading drummer Bob Webster. Our reputation continued to spread and appearances on the TV programmes “Opportunity Knocks” and “The Good Old Days” from the City Varieties Theatre, together with engagements to support the Scottish Wrestling Team helped to provide good publicity. 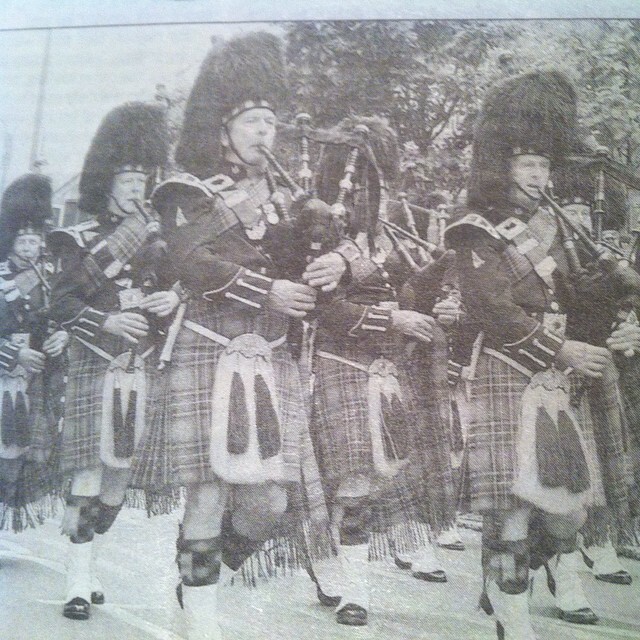 The pipe band was sorry to lose the services of P/Sgt William Bell who joined Pontefract Pipe band as Pipe Major at the end of 1969. A former member of the Glasgow Shepherds Pipe Band, Bill was one of the driving forces behind the Band’s progress in competition, the highlight of which was achieving 1st place in the Grade 4 at the Cowal Highland Gathering, one of the five major competitions for Pipe Bands. In the early 1970s more successes in competition followed, with a subsequent re-grading to Grade 3. 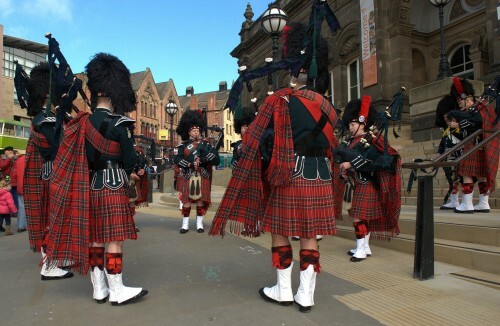 Meanwhile the band continued to flourish and the learners’ class, held in conjunction with the then Leeds Education Committee, and which had started in the early days of the band, was providing a constant source of pipers to replace leavers. Loyal band members some of these proved to be – three of these student pipers from the 60s are still active playing members today. The learners’ group is still in existence, but is now run entirely by the pipe band each Monday evening. You can get in touch using the contact form. 1972 saw Leeds United returning from Wembley with the F.A. Cup and the Band was there to greet them. In subsequent years we also played at Elland Road Ground for the Benefit matches arranged for the great players Jack Charlton, Billy Bremner and Peter Lorimer. 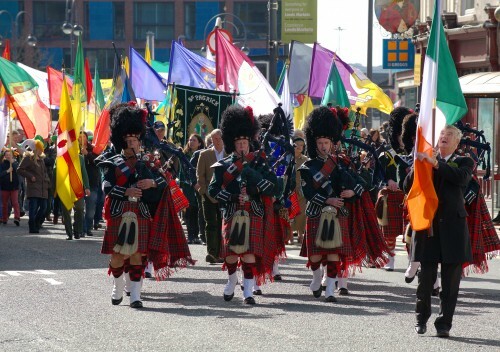 Leeds City Council introduced a Lord Mayor’s Parade during this period and we were part of this event for many years. We also participated in a variety of new events including various fund-raisers for the Variety Club of Great Britain and the Northern Horse Show. A visit to Dortmund, twinned with Leeds, to join their 1100 years celebration was a great success (as was the visit to one of the local breweries!). Shortly after our return to Leeds, we were accorded a Civic Reception by the Lord Mayor. In more recent years, we have concentrated on being an entertainment band. We have continuing strong demand for our appearance at many Carnivals and Galas, especially during the summer months throughout the county of Yorkshire. We are proud of our past achievements and are determined to continue creating the opportunities for learners to achieve their ambitions. Current membership stands at over 20 playing members, with a very active beginner’s class. Our Drum Corps features three generations of one family, with Natasha joining her mother and grandfather. In 2010, we celebrated our 50th anniversary and look forward to being able to continue to fulfil the objectives of our founding members so many years ago. This last year has seen a sudden influx of new members, of various ages, standards and experience and so we are encouraged to feel that the interest in this element of our British tradition and culture is still thriving in 2015!